DHARAMSHALA: Inaugurating the Tibet Policy Institute at the Kashag Secretariat today, Kalon Tripa said the institute aims to carry out comprehensive research works on all aspect of Tibet-related issues, which he underlined would help the administration in framing policies for the next fifty years and making the Tibet issue a competent case on the international platform. The Kashag attaches great importance to the Tibet Policy Institute, Kalon Tripa said, adding that a clear and in-depth research materials on every aspect of Tibet issue would play a pivotal role in framing policies and plans for the next fifty years. He underscored the need for the researchers at the policy institute to carry out research on both past and present political, environmental, and economical situation in Tibet, geopolitics of China, US and Asia vis-a-vis the issue of Tibet. Kalon Tripa also expressed hope and emphasised the need to have competent researchers and pledged to make every effort to realise this goal. He called on the researchers including the staff of the Tibet Policy Institute and other CTA officials, to make best develop the know how and their interests in research works on issues relating to Tibet. Aiming to make Gangchen Kyishong, the seat of the Central Tibetan Administration in Dharamsala, as an “Intellectual Hub”, Kalon Tripa said top researchers from India and abroad will be invited to hold monthly and annual debates and symposiums to hone the skills and knowledge of the Tibetan researchers. Kalon Tripa praised the efforts made by former researchers of the Central Tibetan Administration for their valuable research work and the materials published. In his remarks, Mr Thubten Samphel, the newly appointed director of the Tibet Policy Institute, said the policy institute would strive to focus on research towards evolving policies to tackle challenges in the coming fifty years in all spheres of Tibet issue. “We highly appreciate and thank the director and staff members of the Research and Analysis Unit for their valuable research works considering the resources available to them, said Mr Samphel, who will take charge of the Tibet policy Institute on 2 March. 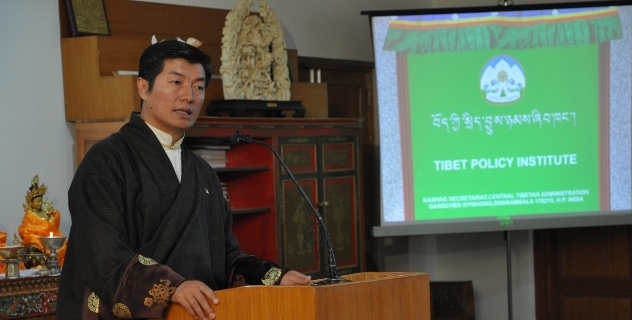 “To fufil the Kashag’s aspirations, researchers at the policy institute would make their best possible efforts to pool their energy and interests in all aspects of the Tibetan issue,” he said. Mr Lobsang, Additional Secretary at the Tibet Policy Institute, presented an overview of some of the key research works carried out by the Central Tibetan Administration on the issue of Tibet till today.